So it’s been a couple of weeks since the end of the Pattern Review Sewing Bee, and I have to admit I haven’t sewn a stitch since I finished my Round 4 project. My hat goes off to so many of the other talented participants who’ve churned out incredible garments post-Bee; I just haven’t had the energy. To be fair, the evacuation that happened during the middle of the last round really took the energy out of me. I’ve finally restored most of my things to their proper places, and I’m finally looking at heading back to the sewing space this week. After a much-needed tidying session, I’ll be launching into another labor intensive project – a wool coat for my dad. Originally, I’d planned to make this for him last year, but I wasn’t loving the fabric we ordered, so I wasn’t motivated to start. I’ve since ordered new wool coating, and then planned on entering it in the Wool Coat Contest at Pattern Review, but I just couldn’t muster the effort needed for such a project after the Bee. He’ll need it for an upcoming trip to New York though, so I’ve got to roll it out on something of a deadline now. (Side note: said trip is to visit family in New York, and I’m going! If any of my NY peeps out there have advice for visiting the Garment District on a weekend, let me know! I know the weekend isn’t ideal, but it’s what I’ve got, so if there are any suggestions for me, please leave a comment.) Otherwise, I’ve also got a few commissioned projects to be working on, thankfully with somewhat flexible deadlines, so that’ll be happening on a somewhat slower schedule. I’ve also got a few holiday parties lined up this year, so I’m hoping to make a few new things that will be both quick and stylish for those. Also on my to-do-list is learning how to digitize images for machine embroidery; I’ve definitely got the embroidery bug after making my Round 3 reversible jacket, and I don’t see it ending anytime soon. Vogue 8940 – On the cutting table. Anyway, rather than spending time actually sewing, I’ve been spending time thinking about what I want to sew next. I’ve got a list a mile long of projects I want to make, plus a stash 20 feet deep with fabrics I want to sew. I’ve definitely got ideas and materials, so that’s not an issue. But this past year I’ve really been thinking a lot of about clothing in terms of a wardrobe, especially since my participation in the Pattern Sudoku Contest earlier this year. This really took a turn when I discovered the various style and color typing systems over the summer, and I’ve recently been spending my time delving further into the various recommendations from different sources, and synthesizing this into something I can use moving forward. I think this all really comes from (1) the desire to dress more like an adult (2) the realization that I don’t wear a lot of what I make (I’ll either wear something to death or not at all) and (3) trying to maximize my sewing time by making things I will wear more often. The irony in all this is that, by the time I’ve circled back around through all of my research, it is very similar to the exploration I did with the Wardrobe Architect series at the beginning of my thinking about a doing a wardrobe overhaul. Before, though, I sort of felt like I was haphazardly throwing things together because I sort of liked them, without any real vision of the end goal, and now I feel like I’m throwing similar things together but with a better understanding of why I like them. If you are a results sort of person, then this whole exploration probably feels like a redundant waste of time, especially since I seem to find myself ending up in a very similar place as before. However, I’m much more of a process sort of person; I think going through all of the different sources has given me a much clearer understanding of what I am trying to achieve, and why I’m trying to achieve it. I hadn’t intended to ramble this much about wardrobe planning in this post, but it’s sort of where my headspace is at right now. I’ve definitely got some more concrete/cohesive/extensive posts in the works though, so I’ll continue my Wardrobe Planning series there. (1) I’m so happy I decided to enter the Bee this year! Last year the timing hadn’t been the best; other life events left me exhausted and burnt out after being eliminated in the second round. This year I thankfully had a much freer schedule and I could dedicate more time and energy to the Bee, and I really enjoyed participating in all four rounds. (2) There is a certain sense of having “made it” to a new level. 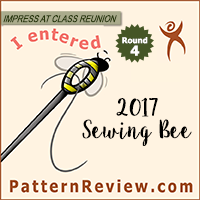 I feel like I really pushed myself during the Bee and am a better sewist because of it. I don’t know how you feel, but it’s hard not to compare your own makes to other sewists on the blog-o-sphere; we live in a world where inspiration and self-measure go hand in hand. I’ve always felt my sewing projects were somewhat lacking in the quality department; certainly most were good enough to wear, but very few had the clean finishes or perfect hems that I’ve drooled over in the work of others. Yet, aside from the tragic mishap of the back welt pockets and slightly short crotch curve of my Round 4 jumpsuit, I was actually really proud of the quality of sewing I produced for the Bee, especially on a restrictive time limit. Hems lined up, zippers looked clean, seams were tidy both outside and in, linings didn’t make things bunch in weird ways… I was pleased, and a bit shocked. I certainly feel as though I’ve leveled up from these experiences though. I mean, sure, there are still plenty of things I haven’t tried, and lots of skills for me to master, but I think my ability to produce a well made, decently fitting garment has certainly been kicked up a notch, and more than anything that is a great takeaway from the Bee. 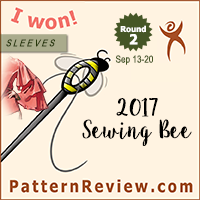 (3) I won my first Pattern Review contest! I’m still really excited by this. I sort of love how the Bee gave me an excuse to do something crazy, like my fabulous sleeve gown, which I never would have made otherwise. I’ve been pretty vocal about not loving the big sleeve trend that’s been happening here on the blog, so while I wasn’t surprised by the challenge, I also wasn’t immediately excited by it either. Interestingly, it seemed that while many of the other contestants were in a similar boat, their solution was to try to make something they would consider “wearable” in everyday life, and my solution was to go completely the other way. I sort of love that about the Bee; you get to see so many creative thought processes, and really appreciate vast amount of talent and skill that the other participants have. (4) I love my Round 3 Bomber Jacket, which I’ve been wearing more than any of the other pieces I made. Just for future reference, I really like the close fit, which is what I was going for in the Bee, but I think future versions will probably need an inch added to both the length of the sleeves and the bodice. It’s interesting how living in a garment gives a whole different perspective from just photographing it for the blog. Also, interestingly, I recently wore this jacket out to dinner, crazy colorful side out. When I got to the restaurant, literally everyone was wearing black, grey, olive, or navy, except me. It was like being in a black and white tv show! I have to ask my fellow sewists – in a world saturated with YouTube videos telling you how to create a capsule wardrobe full of neutrals, do you ever feel like the most colorful person in the room? I sort of wonder if I would have even noticed if I’d bought the jacket rather than made it. Do you ever get self-conscious when you wear something you’ve made for the first time? If anything, the photos of my Bee projects have me pretty well convinced that not only do I like the Bright Winter colors, I like them on me. Although unintentional, I feel like this sort of cements me in the Bright Winter camp for now. And I’m actually pretty excited to plan some capsule sewing projects based on color schemes from within the Bright Winter palette because I enjoy the colors of the projects I made during the Bee. (6) I should make wearable muslins more often. (7) Although I’ve felt lack of energy to actually sew, I’ve definitely been motivated by the Bee to consider more specific inspirations for future sewing projects. Perhaps my Pink Floyd skirt was a bit literal, as was my anteater jacket, but I found that having a very specific inspiration allowed me to be more creative in my execution of the garments, as opposed to my usual thought process, which is something akin to “Oooh, shiny. I want one.” Although I see a bit of “ooh shiny” sewing in my near future, this idea of having more specific inspirations mixed with all the time I’ve spent pondering style archetypes and color palettes definitely gives me ideas for sewing goals for next year. I think that’s enough of a ramble for now. I’m finally feeling the sew-jo returning, so I’ll likely be busy attending to to actually sewing projects for a while. In the meantime, I’m looking forward to Burda’s announcement of the December issue – the line drawings I’ve seen so far look intriguing. In the meantime feel free to leave a comment about any of the random tangents I went on in this post, or about how you deal with burnout after a large scale project. Do you have to wait for the energy to come back? Or do you press on full steam ahead without pause? Firstly, you look absolutely stunning in the red dress. That particular shade of red seems made for your colouring! And, the style is exquisite! I also love the blue jumpsuit on you, both the colour and style. You are definitely a bright winter. The red Lipstick suits you as well. I’m looking for a coat to sew for my husband, like the one you are makings for your father. Is the pattern still available? Have a wonderful trip! I’d say try to shop for fabric on Saturday, because not everything is open on Sunday. I love going to M&J Trimming on 6th Ave even if I don’t need anything–it is a candy shop for sewers! Elegant Fabrics on 40th is lovely, with everything swatched on the ends of rolls so it is easy to see. I’m intrigued by what you say about colours because my experience is pretty much the opposite. I’m usually dressed in grey, black, and the odd metallic and people around me are often in purple or pink. But the lovely thing about sewing is that we can have whatever colours we want, up to a point – finding the fabric isn’t always easy but we have more choice than with RTW. Looking forward to seeing your Dad’s coat. You totally rock the all black and grey though. And sewing let’s us make more interesting clothes, which can do a lot to enhance a monochromatic color scheme. Not so much the case when everyone is wearing the same “basics” from Forever 21. Yeah. I mean, I know the frosting vs. cake debate is as old as the internet, but I think I’m looking at this from the point of needing to make cake, but wanting to have it interesting enough to make myself motivated to do it. Slightly frosted cake? Barely cream-cheesed bagels? However you want to refer to it, I’m looking for a way to mix the wearability with the fun factor, but maximize the final use of the garment. That is what I like about many of the Burda designs… Some are a mite WTF, but there are many basic patterns of theirs that they make interesting (to me, at least) with small additions and stuff. And good grief but Pinterest has a TON of photos of high-end clothes for inspiration, along with pics of what people do to dress up their makes. Shopping with my 19 year old daughter is great because going into those stores with super-expensive clothes is so educational… Many clothes are SUPER simple patterns just with zippers put in different, or a mix of fabric, or (shudder) seams left unfinished. Lots of thinking and processing happening here. Curious as to how much doing the PhD has affected how you think or approach things now. Your dresses and jacket are awesome! I think it makes me overthink things and delve more deeply into available resources. It also probably makes me too reliant on DIY methods because no one holds your hand in research. These are probably ok things for sewing, but maybe not the best approaches to life. That mens coat pattern looks incredible (and a lot of work to do well), can’t wait to see it. It’s great to see all your Bee creations in one post, such an amazing variety of garments and all beautifully made. That you produced them under time pressure and while having to evacuate is quite amazing really, no wonder you needed a bit of a sewing break.